J.D. 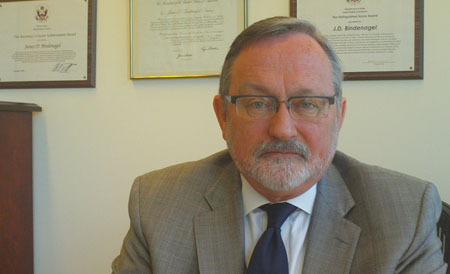 Bindenagel served for more than a quarter-century in foreign service on behalf of the United States, including a role as acting Ambassador to Germany in 1997. Currently the vice president for Community, Government, and International Affairs at DePaul University, Bindenagel shared his thoughts on the upcoming NATO summit, scheduled for May 20-21 at McCormick Place. Q: Which major issues do you expect to be discussed at the NATO summit? A: Specifically, there will be issues of course in Afghanistan: When we leave, what we leave behind, [and] what the role of NATO will be in the future is probably the leading issue that will be discussed. What’s happening in Syria and Iran will play a very, very critical role. Q: What should Chicagoans expect? A: These issues that we just discussed will put Chicago in the center of the world. “All the world is watching,” is what I like to say. They will be looking to see Chicago, never having seen what Chicago is and how it works and how we live. It will be a very good, strong way for Chicago and the people of Chicago to showcase the great city we have. Q: What kind of role and influence can protestors have on foreign dignitaries and diplomats? How disruptive can they be and what type of impact can they have on the summit? A: Protests are usually on the street and they come, hopefully peacefully, with issues. The media picks up those issues and there is a discussion and sometimes the discussion will reach inside the discussion of the summit, but for the most part, it’s a public display of discussion: What the summiteers are saying and what the demonstrators are saying. Q: What type of impact will Vladimir Putin’s absence have on the summit and does his absence send a message to the other NATO countries? A: Putin is newly re-elected, and asked actually to be considered for not having gone through all the issues, not having been prepared to debate all the issues all the time at that level. It’s regrettable that he’s not going to be there because personal contact is always revealing of issues and it helps one find compromise and commonality. Q: How has Washington Treaty Article Five, an attack against one is an attack against all, been implemented in recent history and how has it changed national security since 9/11? A: Until 9/11 we had never invoked Article Five. The Europeans brought up the issue of Article Five [after 9/11] and it was invoked for the first and only time in NATO’s history. That brought NATO together with us in our efforts in Afghanistan, which is out of NATO’s area, out of the historical conflict, which was Europe, to maintain peace in Europe, and brought us together into the Afghanistan War. Q: How will Syria be discussed in the NATO summit? A: When you get to Syria, what is the basis for intervention? One is these war crimes, crimes against humanity, ethnic cleansing, and genocide -- it’s fairly clear that the government internally is moving against its opposition with blood. Second is who would intervene? Would NATO intervene as in Libya with others that are Arab states, since it is an Arab state? They said no. The United Nations, giving legal authority, efforts to intervene were vetoed by China and by Russia. While there is a genocide or at least ethnic cleansing, religious war, or whatever crimes against humanity or war crimes, that’s not enough. So we have to look at the partnerships that would have to come together to intervene and the legal basis for which to do that. Q: How open will the United States be to discussing their exit strategy in Afghanistan with other NATO members? A: The U.S proposals have been fairly explicit. In February, [Defense Secretary] Panetta made a suggestion about withdrawal in 2013, so there is a fairly transparent public discussion that is accompanying right now the withdrawal. This has been a debate that has been very public. The strategic discussion was set by Karzai when Karzai, who will be here, said 2014 [for troops to leave Afghanistan]. So if you’re now having the Secretary of Defense talking about 2013 and Karzai talking about 2014, there is not a lot of difference between those two but there is a tremendous amount of work that has to come and that’s where the discussion focuses on what we call a comprehensive approach. Do we also on the other side have a role that’s parallel to that, the civilian side? Stability in military operations, stability in reconstruction, or development issues as we call them – nation building. What are those issues? Who will do it and at what cost? That’s the real debate that will follow in the decisions when you’re actually going to leave. What do you do? You don’t want to leave and create a haven again for terrorists who will then attack us here in the United States or elsewhere. Q: How will recent events in Afghanistan, including the Koran burnings, the U.S soldier who killed 17 civilians and recent embassy bombings in Kabul affect the exit strategy in Afghanistan as well as negotiations with the Taliban? A: Those terrible, horrible things have complicated the debate. One, in our own country, [there] is increasing pressure for us and European populations to demand an earlier withdrawal, just leave. That will grow and we will see some of that in the protests, I’m sure. Q: Do you expect other NATO countries to join the United States on the forefront of opposing Iran and their nuclear program? A: Everyone is opposed to Iran getting nuclear weapons. There is even a debate internally in Iran whether they should get nuclear weapons. That debate needs to be on the forefront. The question is: what do you do about it? My philosophy, not the U.S government’s, my philosophy is denial; delay is denial. So if you can delay their program you are denying them nuclear weapons. That’s not a perfect solution by any means but if you can delay . . . you can keep them from gaining the ability. Another option is more dramatic: That’s bombing them. That’s a very highly uncertain outcome, one that I certainly don’t agree with myself. Q: How closely will non-NATO countries such as Iran and Pakistan be looking in on the summit? A: Everybody in the world will be watching. Pakistan is extremely interested in what’s going on in Afghanistan. The Iranians are absolutely interested in what NATO is doing, absolutely.